Reminiscent of a sweet banana Popsicle with hints of tropical citrus, the banana Daiquiri makes a wonderful "grown up" summer cocktail. It's a good treat to have on a hot day since it can make you think of the tropics. The history of this sweet cocktail varies depending on who you ask. Some people say that the drink was invented in Cuba in the late 1800s, while others claim that British restaurateur Conrad Graves made the first banana Daiquiri at the Mountain Top bar in St. Thomas, U.S. Virgin Islands, in the 1950s. The popularity of this cocktail surged in the 1980s, and it made another comeback in recent years. If you have a bunch of very ripe bananas in your kitchen, it's the perfect time to mix up a banana Daiquiri. You will also need rum, fresh limes, ice and banana liqueur. To make one Daiquiri, peel and slice a banana, and squeeze the juice from one lime. Measure two ounces of rum, either dark or light depending on how rich you prefer your drink, and one-and-a-half ounces of banana liqueur. Bananas and limes may seem like a strange combination, but the sweet and sour together form a perfect combination. Try it once, and you may find yourself quite pleasantly surprised. After you have assembled and measured your ingredients, place them in a blender with ice. Crushed ice breaks down faster, but the pulse function on your blender will smooth out larger cubes. If using cubes, add the ice to the blender before the other ingredients so that your drink will mix up easier. Blend the mixture until it's silky smooth, and then pour into a glass. While you can drink your banana cocktail from a traditional Daiquiri glass, you can also change it up by sipping from a champagne, Martini or Margarita glass. Garnish the drink with a maraschino cherry. If you want a sweeter Daiquiri, add some simple syrup or triple sec to taste. In a pinch, stir in powdered sugar with a little water. For a creamier concoction, use equal parts banana liqueur and Creme de Cacao or Creme de Banana. 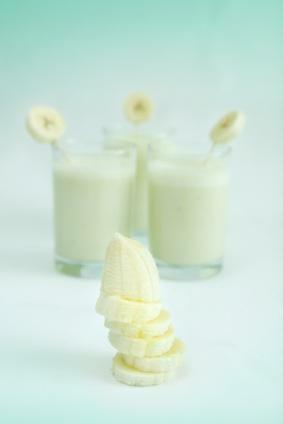 Strain a frozen banana Daiquiri to remove fibrous bits of fruit. Chill your glasses in the freezer beforehand for an extra frosty treat. To save time, use banana Daiquiri mix in either frozen or liquid form. All you need to do is add rum and ice. Combine banana with other fruits such as strawberries, mangoes or peaches for a more complex cocktail. Float a shot of rum on top for a stronger cocktail. Blend a virgin version by substituting pineapple juice and a splash of lemonade for the rum. Make your Daiquiri look extra festive with a colorful umbrella or straw. To literally add color to your cocktail, pour in a splash of maraschino liqueur or grenadine. Instead of making simple smoothies next time you have bananas in danger of going to waste, blend a batch of frozen banana Daiquiris for an indulgent treat. It's certainly more refreshing, and arguably more fun, than making a loaf of banana bread.